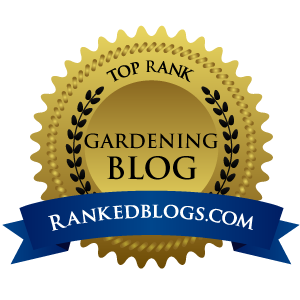 The post I did in 2018 about new perennial introductions by Proven Winners® was very popular with readers. No surprise there–who doesn't like looking at pretty new plants on a grey winter's day? So I'm repeating that theme with a selection of the new perennials for 2019. On a side note, this is not a sponsored post. I'm simply highlighting a few of the new introductions that happened to catch my eye. 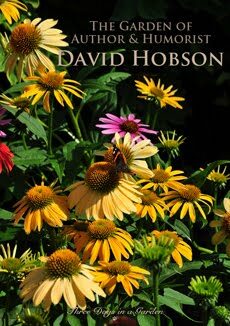 I have come to love and depend upon both Salvia and Veronica. 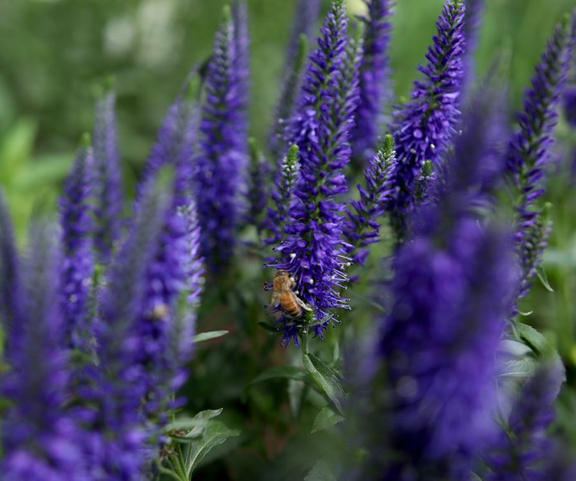 With their tall, spiky flowers both plants look quite similar, but Salvia blooms in spring while Veronica flowers in summer (both perennials can be encouraged to rebloom by giving them a light pruning after they finish their first show of flowers). Salvia and Catmint at Edwards Garden in Toronto. 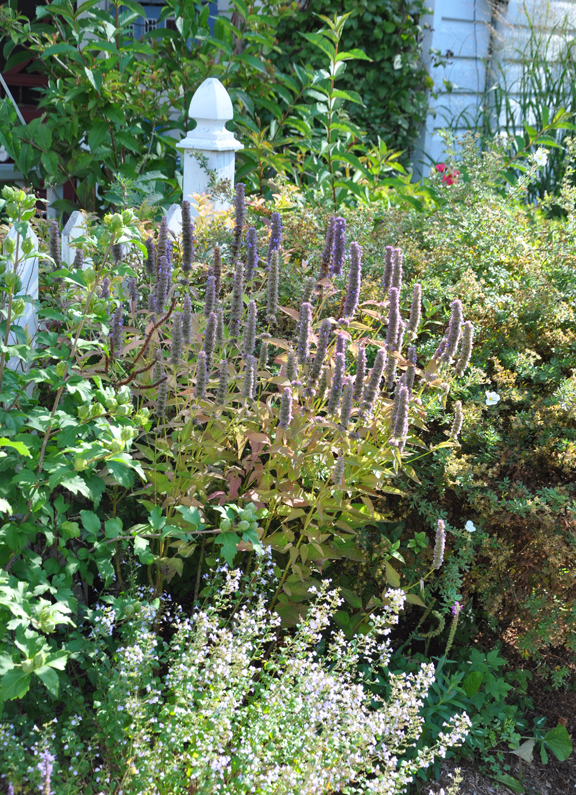 Salvia with Baptisia and peonies. Both Salvia and Veronica need full sun. In too much shade, I find they don't perform well. These two perennials seem quite happy in average garden soil with a regular source of water (either by Mother Nature's hand or via the garden hose). If they are stressed by drought, they can develop powdery mildew. 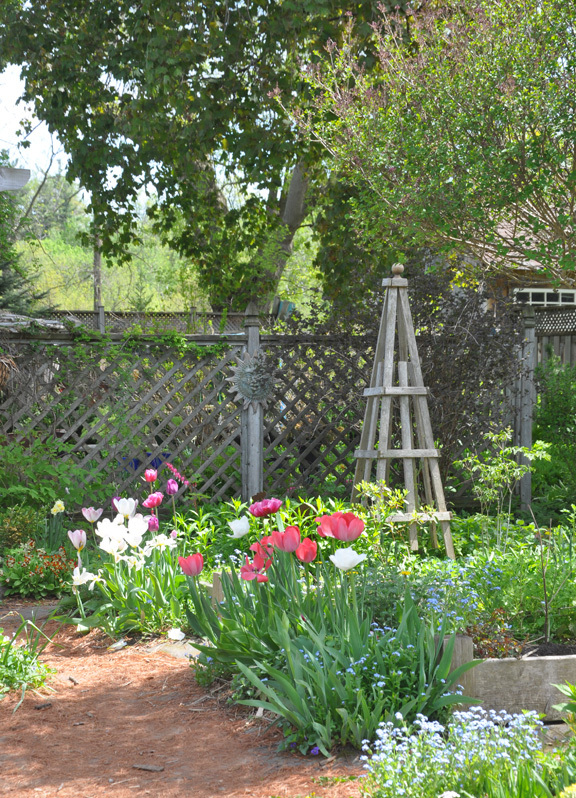 I count on Salvia to fill the void that occurs every spring after tulips are finished. 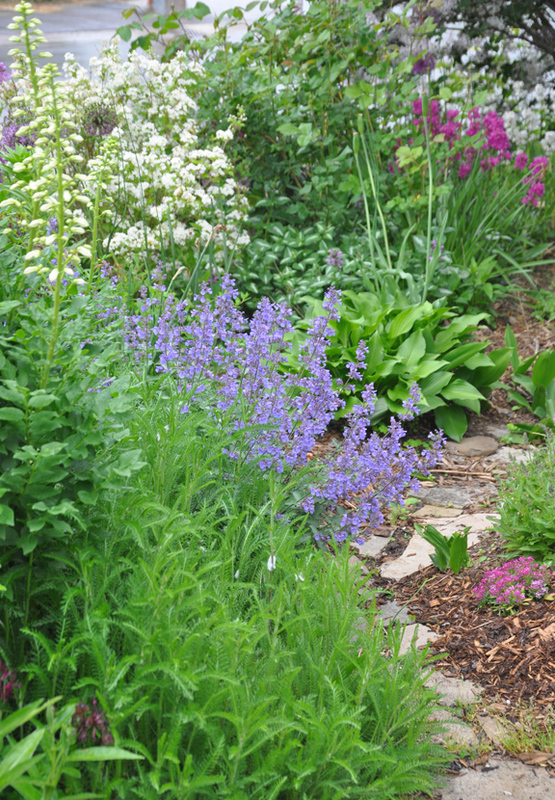 Salvia makes a great companion for Baptisia, Gas Plant (Dictamnus), Blue Star (Amsonia), Catmint (Nepeta), Alliums, peonies and early roses. 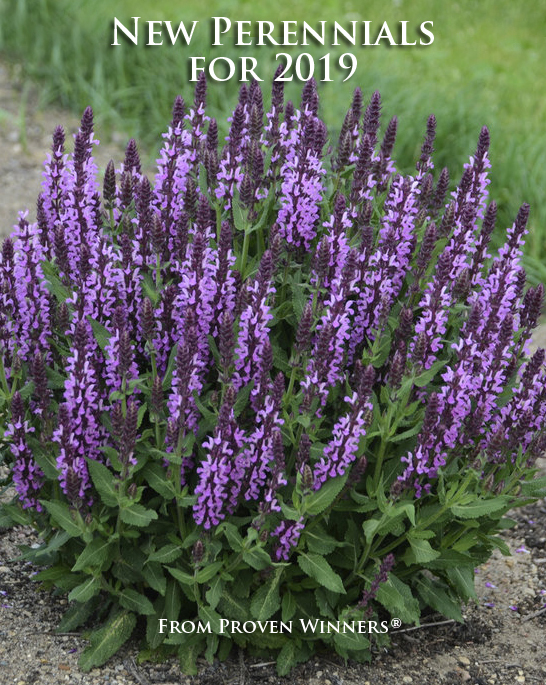 This brings me to the new varieties of Salvias that Proven Winners is launching in 2019. 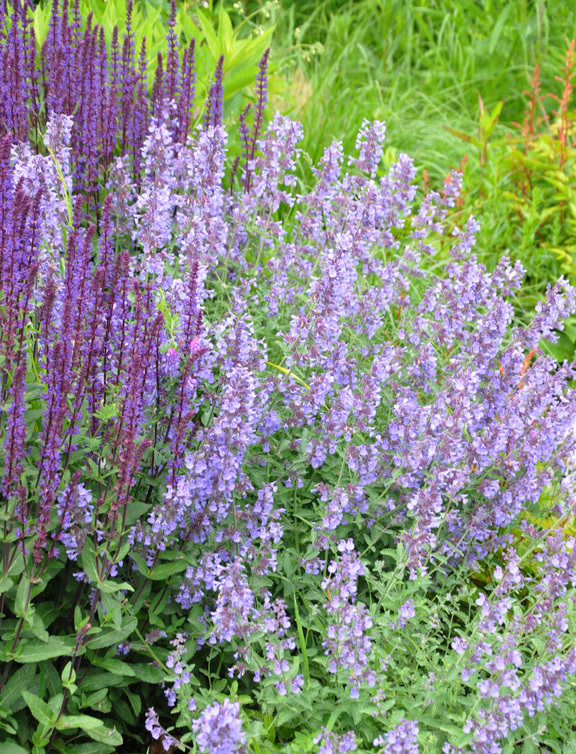 The first Salvia caught my interest because of its pale blue color. 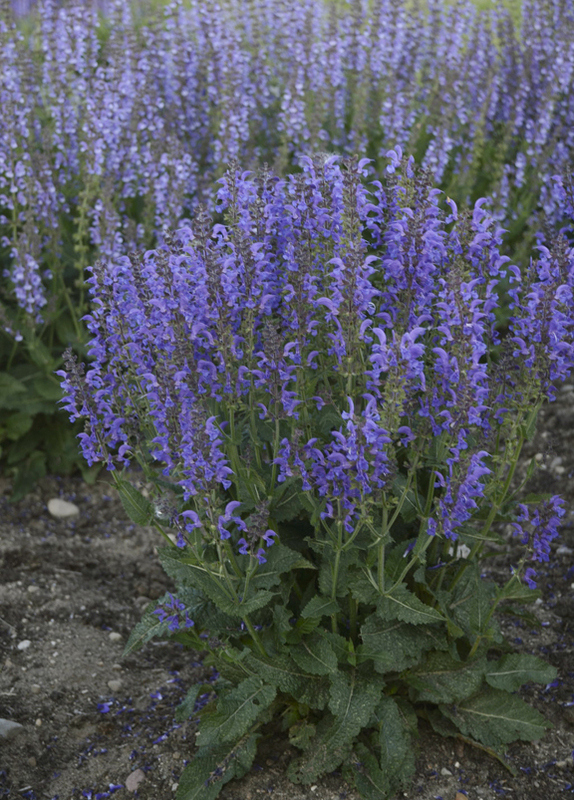 Perfect Profusion® Perennial Salvia, Salvia nemorosa has soft, icy-blue flowers in late spring/early summer. 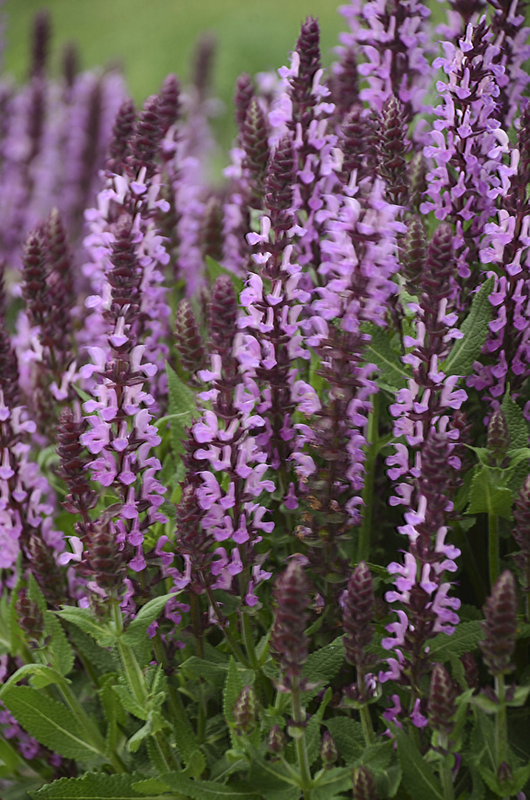 This cultivar is purported to be one of Proven Winner's best Salvias for consistent rebloom. It is drought tolerant but blooms better with average moisture. Cut the plant back after flowering to promote rebloom. Full sun. Height:16 - 20 inches (40-50 cm), Spread:16 - 20 inches (40-50 cm). USDA zones: 3-8. Pink Profusion® Perennial Salvia, Salvia nemorosa from Proven Winners. Pink Profusion® Perennial Salvia, Salvia nemorosa has dark pink flowers that are attractive to bees, butterflies and hummingbirds. This plant has a nice rounded shape (see opening image). Cut the plant back after flowering to promote rebloom. Full sun. Average moisture. Height:14 -16 inches (35-40 cm), Spread:16 - 20 inches (40-50 cm). USDA zones: 3-8. 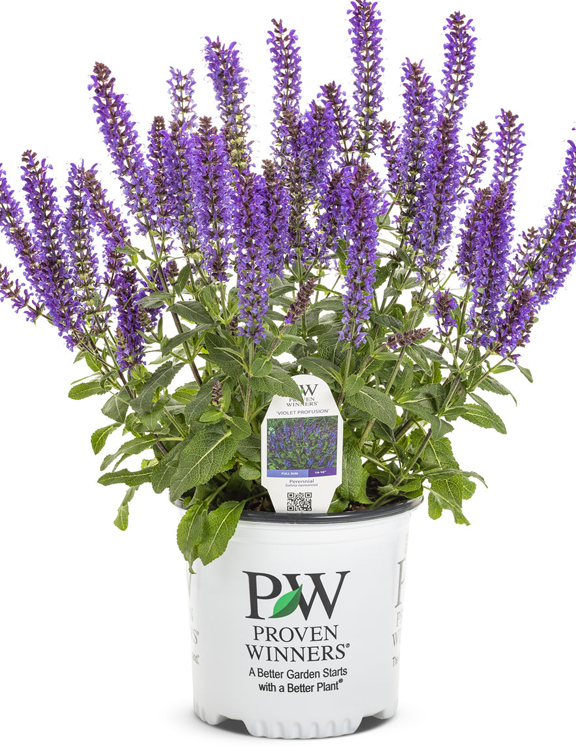 Violet Profusion® Perennial Salvia, Salvia nemorosa from Proven Winners. 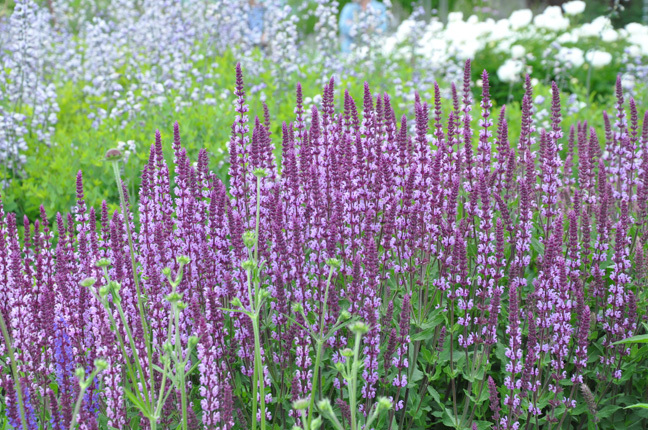 Violet Profusion® Perennial Salvia, Salvia nemorosa has fragrant violet-blue flowers that are produced on rosy-purple calyxes. Again this plant has a nice rounded shape. Full sun. Average moisture. Height:14 -16 inches (35-40 cm), Spread:16 - 20 inches. USDA zones: 3-8. Color Spires® Indiglo Girl Perennial Salvia, Salvia hybrid from Proven Winners. 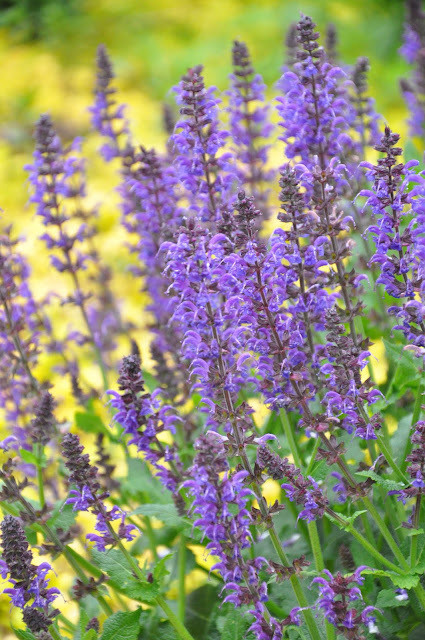 Color Spires® Indiglo Girl Perennial Salvia, Salvia hybrid has fragrant indigo blue flowers that are held in dark calyxes. It will rebloom if cut back after flowering. Height: 20 - 22 inches (50-55 cm), Spread: 20 - 22 inches (50-55 cm). USDA zones: 3-8. 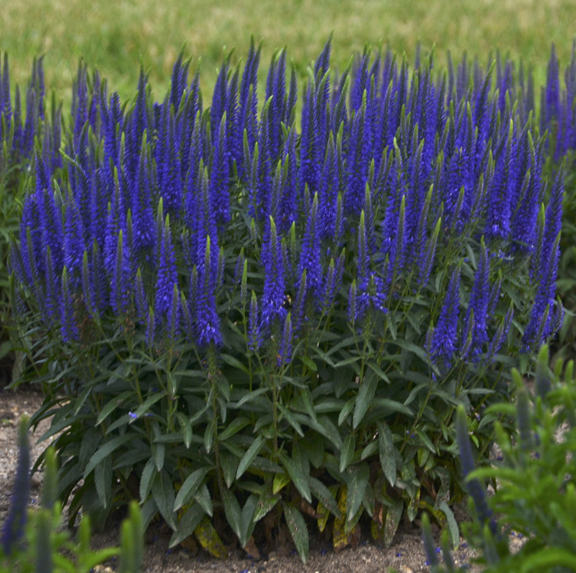 Magic Show® 'Wizard of Ahhs' Spike Speedwell, Veronica hybrid has violet-blue flowers and dark green foliage. It likes average to moist, enriched, well-drained soil. Shear back after flowering to encourage new blooms. Full sun. Height:18 - 22 inches (45-55 cm), Spread:18 - 22 inches (45-55 cm). USDA zones: 4-8. Agastache 'Blue Fortune' with Calamintha in the foreground. I could see Veronica 'Indiglo Girl' working with my favourite Agastache, my lavender colored Phlox or maybe even a Catmint. Catmint in the front garden. Next up is a new Catmint. Catmint is yet another plant I have come to treasure. It blooms reliably from June well into the autumn. It has fragrant grey-green foliage and is a magnet for bees. A shameless plant collector, I already have three different sizes of Catmint in my garden– the classic Catmint, Nepeta racemosa 'Walker's Low' and two dwarf varieties. While I think 'Walker's Low' is the showiest, the dwarf forms are also excellent at the front of a flowerbed. Next summer I plan to use one of the dwarf types of Catmint to create a low hedge around the perimeter of two of my four raised beds. The blue flowers and grey-green foliage should have the same effect as a row of lavender (but will be more winter hardy). In the centre of the raised beds, I am thinking of planting roses and/or annuals. area as nursery beds for other projects. lilac at the very centre. 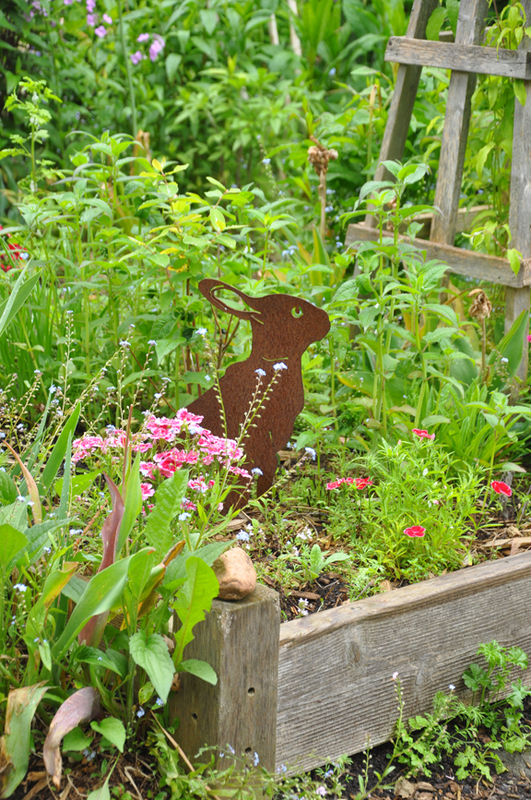 One of the raised beds is filled with herbs. The other three are largely empty at the moment. 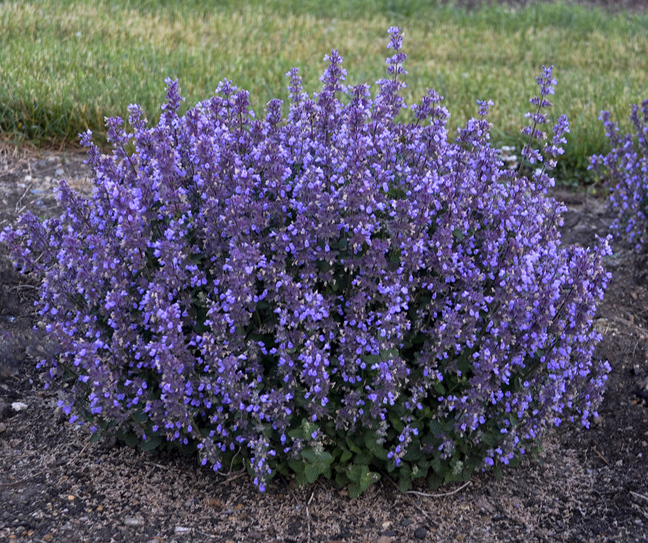 'Cat's Pajamas' Catmint Nepeta hybrid from Proven Winners. 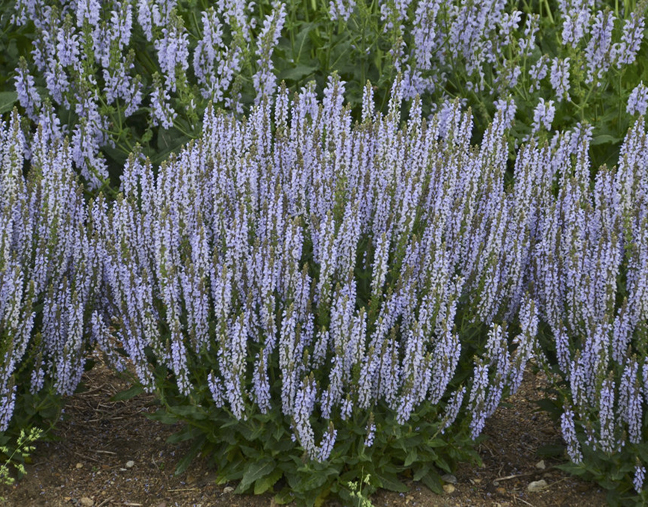 'Cat's Pajamas' Catmint Nepeta hybrid has indigo blue flowers are produced all the way from the soil to the tips of its stems. Rosy purple calyxes extend the color when the blooms are past peak. This long-blooming perennial has a nice compact shape and fragrant foliage. Heat and drought tolerant. Average, well-drained soil with low to average moisture is best. Plants respond well to shearing to promote rebloom. Full sun. Height:12-14 inches (30-35 cm), Spread:18 - 20 inches (45-50 cm). USDA zones: 3-8. Shadowland® Etched Glass Hosta hybrid from Proven Winners. Shadowland® Etched Glass Hosta has foliage with wide, dark-green margins that contrast nicely with a brilliant yellow centre. The leaves have attractive puckering when the plant is mature. The flower on this hosta is almost white. Moist, well-drained, organically enriched soil is best for this hosta. Part-shade to Shade. Height:18 inches (45 cm), Spread: 36 inches (91 cm). USDA zones: 3-9. 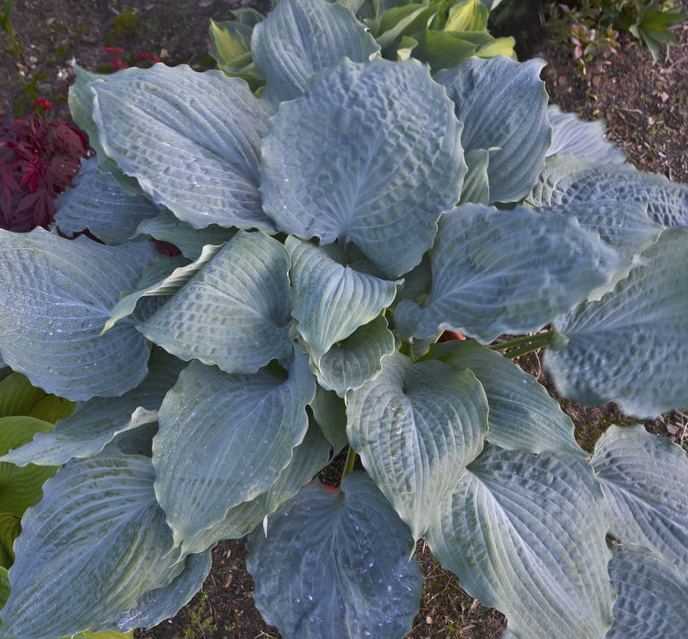 Shadowland® Diamond Lake Hosta hybrid is a large-sized hosta with thick and heavily corrugated blue-green leaves with wavy margins. The flowers are pale lavender in color. 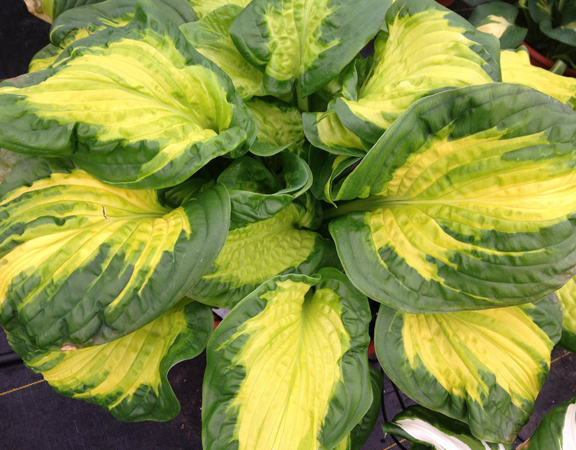 As with most hostas, it prefers moist, well-drained soil that is rich in organic matter. Full to part-shade. Height:17 inches (45 cm), Spread: 45 inches (116 cm). USDA zones: 3-9. 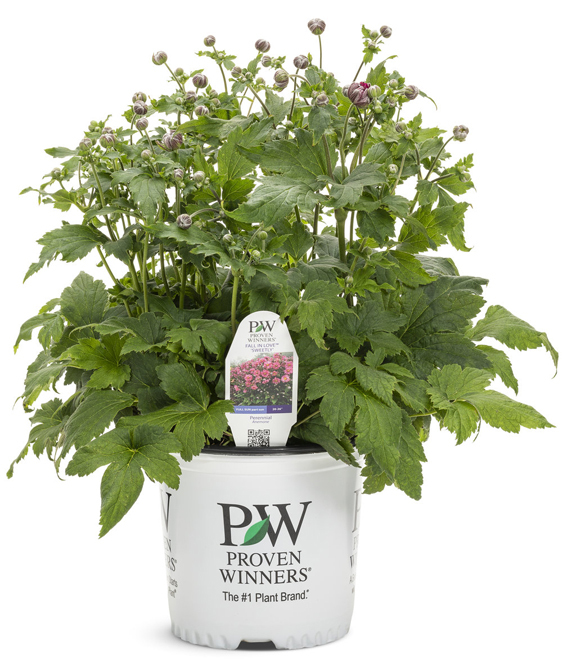 Fall in Love™ Sweetly Japanese Anemone hybrid from Proven Winners. 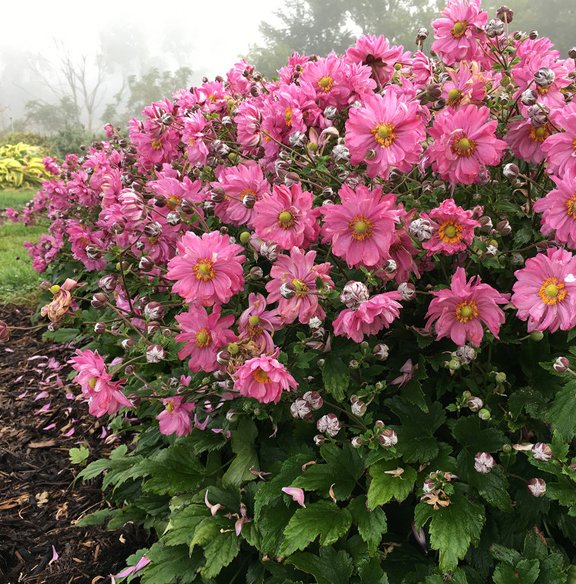 Fall in Love™ Sweetly Japanese Anemone hybrid has semi-double, rose-pink flowers. For most of the summer, the foliage is a large mound of dark green leaves. 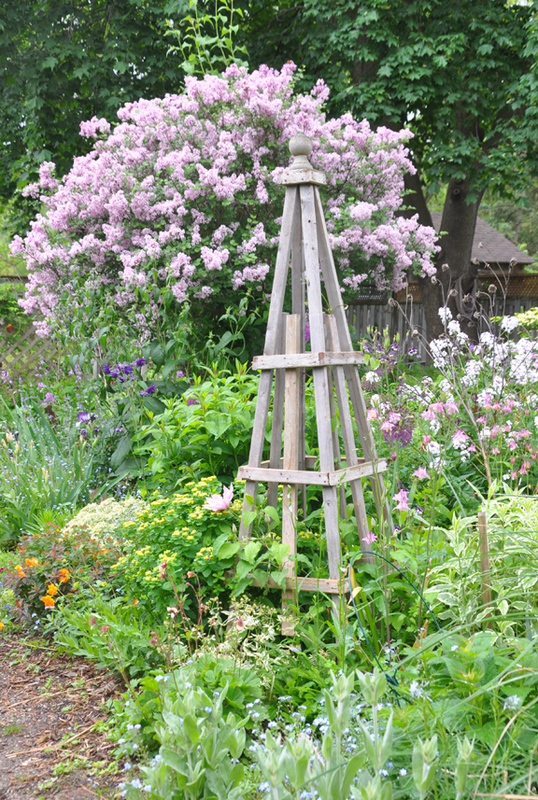 In late summer/fall, flowering stems make the plant's growth more upright. Unlike most Japanese Anemones, this new introduction spreads slowly through rhizomes. Average, moist soil will keep this plant happy. Mulch heavily in the fall for the first two seasons to prevent frost heaving. Part-sun to full sun. Resists deer and rabbits. Height: 24 - 30 inches (60 -76 cm), Spread: 20 - 22 inches (50-55 cm). USDA zones: 4-8. The weather here is rather miserable at the moment, so it's been fun to look at new plants and start to think about spring plans. I can't wait for some warmer weather to arrive! The oldest Salvia I have is Salvia nemorosa 'Cardonna'. I chose it for its deep purple stems and the indigo-blue flowers. 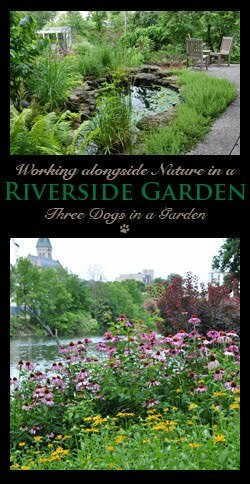 In more recent years, I have added a medium blue and a couple of pink varieties. One thing I need to do better with my Salvias is to create groups of three or more plants. One alone is lost. I'm not keen on salvia -- I don't like the smell -- but I have my eye on that beautiful blue Magic Show® 'Wizard of Ahhs' Spike Speedwell. Very informative posting, Jennifer. Glad you liked the post Pam. 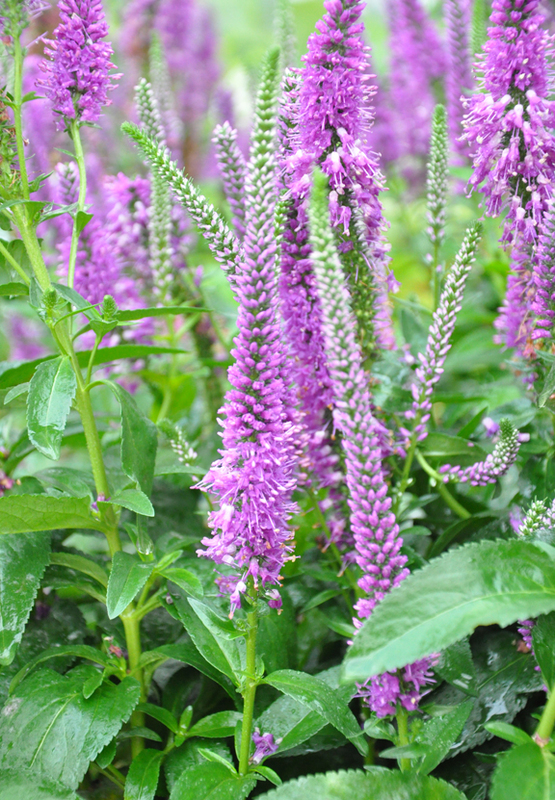 My favourite Veronica is the mauve one I showed Veronica longifolia 'Eveline'. Beautiful blooms, loved them all. I too have Catmint Walker's Low. It gets kind of unruly throughout the season. I would love to know the smaller varieties that you have, Jennifer. I couldn't find my plant tags when I was writing the post, but I have poked around a bit more and found them. Yeah! Catmint, Nepeta 'Junior Walker's Low' is more tidy than 'Walker's Low', so you might like it better. It grows a little over a foot tall. The second one is Catmint, Nepeta faassenii 'Purrsian Blue'. It is about the same size. You may find both these options are less expensive than the new introduction. I'm not sure which caught my attention more, the beautiful flowers or that chiffon cake on your sidebar. That looks scrumptious. Must check out that recipe. I am currently in a new house with no garden to speak of so I am quite happy to study all of these new offerings and dream of what I might be able to pop in the ground somewhere. Yes, that cake looks yummy, doesn't it? A new house with a clean slate is full of opportunities and that is exciting. I think you're wise to learn all you can and not rush into things. You are wise to take your time and enjoy the process. Jennifer, this makes me long for spring! I'm definitely going to have to look for some of these. My favorites are the Cat's Pajamas Catmint and the Fall in Love Anemone. Hang in there, spring will be here before you know it.